Developing practical, efficient and meaningful leisure programs for people with Alzheimer's Disease requires creative thinking. Alzheimer's Disease is a chronic and progressive condition characterized by the decline of cognitive functions such as reasoning, remembering and planning. It affects people in different ways; no two individuals will experience exactly the same progression of the disease. A person's personality, health and social situation are all important factors that influence the impact of dementia. Structured group activities very seldom work. Simple, brief activities offered several times a day are the most effective and beneficial types of activities for Alzheimer's. Activities such as housework and simple games can help to maintain motor skills. Listening to music is also a very calming and engaging activity. The focus should be on the person and not the condition. Try to match people with activities that suit their background and experience. What sorts of activities are most effective? The following ideas may be used on a one-to-one basis and others may be suitable for small groups depending on their abilities. Some of the activities suggested are Montessori based, developed to promote and maintain existing skills. Some activities such as sorting, pairing, matching and puzzles should be offered once and then repeated twice during the week. Despite having poor recollection, people living with Alzheimer's can still learn through practice and repetition. Most activities that require movement: grasping, pressing, pushing, gripping, extending, scooping and reaching are helpful in improving hand-eye coordination. These types of activities also provide sensory stimulation and promote well-being. If utensils or tools are to be used, make sure they are adapted to the needs of individuals. Supervision at all times is essential. Check your resident's profile and collect items according to his/her previous profession or occupation. Place items in a box and present it to the resident two or three times a day for a 'feel, touch & explore'. Give your resident a deck of cards to be separated into suits: spades, hearts, diamond and clubs. All other cards should be removed from pack. Play folk or popular music from your resident's era – this never fails to please. Give residents percussion instruments to add to the fun. This can be played by one or two people, each having three darts to throw. It does not injure players or damage walls. Buy a medium rope and tie a few simple knots. Ask resident to 'help' you untie the knots. Buy large pasta loops for residents to string together with a thick yarn or thin rope. Despite this being somewhat controversial, in my experience doll therapy works well and I would recommend recreation staff try it. The dolls should be dementia specific (and look like newborn babies). Buy a bassinet, a baby bath, a cot and lots of baby clothes. Female residents love to change clothes, wash, and put baby down for a nap. A display of worms or ants in a large glass container (placed in a secure place) is a good subject for conversation. Provide a large cardboard box with dozens of pieces of assorted fabric inside it; silk, lace, felt, velvet, acrylic and wool. Sit 3 or 4 residents around a table and place fabric box in reach of all. Touch, feel and fold. Buy a large beach ball and let sitting residents roll or kick it to each other from their chairs. This provides visual stimulation and is a good topic for conversation. Matching shapes or pictures is a fun game combining sensory stimulation and thinking skills. Similar to the above; residents will match pictures, shapes and other objects together. Give residents colored pom-poms and provide containers of the same color. Residents will place pom-poms in the matching colored container. Another inexpensive 'sorting by color' activity. Buy second hand golf balls and paint or spray in different colours. Give resident an ice-cream scoop to scoop the golf balls into containers of the same colour. Enlarge a photo of the resident or one of his close relatives. Laminate it and cut into four odd pieces for resident to put together. Alternatively: a colorful picture of a car, fruit or landscape also works well. 17. Activities relating to the individual’s former life. For instance, a carpenter may enjoy sanding a nice piece of wood, a post office worker may enjoy stamping envelopes, a home-maker may enjoy arranging pots and pans on a shelf etc. Use safety scissors to cut pictures from calendars; collect enough pictures to make a poster to maintain dexterity and provide a sense of accomplishment. Buy a few dozen cup cakes. Make icing in two colours and put into piping bag. Assist residents to ice one or two cupcakes until they feel confident to do it on their own. Alternatively a plastic spatula will keep them busy and entertained for a while. We'd love to hear your feedback on activities for the elderly with Alzheimer's. Thanks so much for your feedback Barbara! Welcome to the community! I have been given a box of Lego and was wondering if you would recommend it or not? Maybe for building and colour & shape sorting. Hi Louise, yes lego can be used to sort colours and shapes. It also helps to refine dexterity as clients handle the small blocks. Lego blocks are also an excellent intergenerational activity to interact with grandchildren and/or visiting children. Cheers guys lots of info thanks. Thanks for your feedback Nicholas! I would take my mom to the local library and watch You Tube videos, searching for things like "babies laughing" and cute baby animals, etc. She enjoyed them, and it's nice to spend time in a public place. That's a lovely idea Henry. And yes, isn't youtube a wonderful resource! 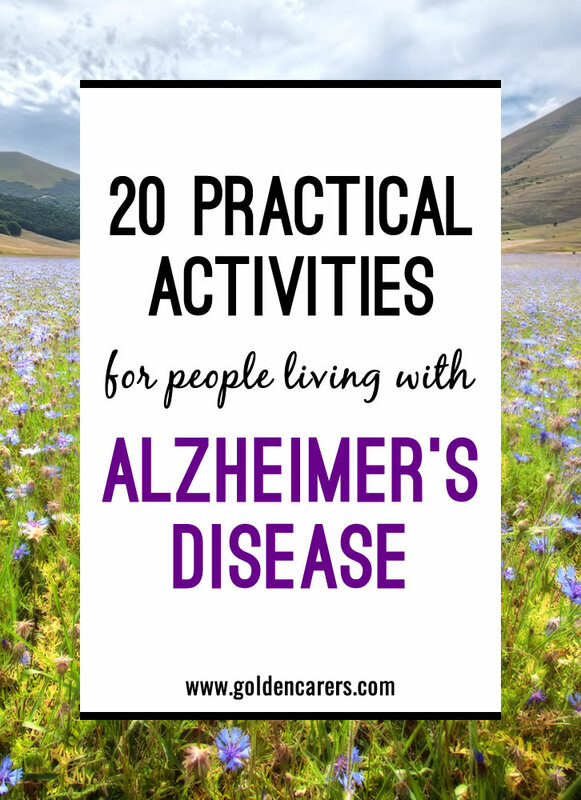 Thank you for sharing these great activities for Alzheimer's patients. These activities will keep them engaged and entertained and will develop their cognitive skills. Thanks so much for your feedback Cassidy! I gave my husband a bump bag, the sort you take on holidays and tie around your waist. It had numerous sections and zippers that I filled with coins, Bali note currency, some of the smaller items that he liked as well as a bandaid, soft lollies, his own personal ID card, his old driver's licence, etc. I saved it for when we were going out and I knew that he would not have the ability to sit for too long. He loved it and it gave him something to talk about with others. Hi Tracy, it depends on the facility’s policies. Some allow air dry clay and ‘bought’ play dough (not homemade). Regarding kinetic sand, I believe it is not suitable for people suffering from late-stage dementia​. ​ I have no experience with kinetic sand but play dough and air drying clay I used ​a lot ​in the past. Consult your management for instructions. Love these ideas Lynda, thanks for sharing! Hello Every One, There are so many great comments here. I am going to comment on one and give an idea that we do in my facility. I am the memory care coordinator in my facility. Budget is always an issue for a small facility in a small town. There are activities that take little or no money to do. A folding box can be old towels, wash clothes or socks, a sorting game can be a deck of cards, a fiddle box can be some items that you may have at home and no longer need and an old purse make a great activity for some ladies. In our memory care we have started a "My Story" book for each resident. we have a questionnaire we ask families to complete such as where I attended school, my favorite color, favorite food, When I married etc. We then take this information a write a story. We also ask the family for photos to go along with the story. we use our office printer to copy the photos then give the original photos back to the family. we add the photos to the story book. We ask family and friends to add stories to the book. we also add pictures we take to the book. We now have a wonderful on going story book we can reminisce with our resident and families with. We love our"My Story" book. I use a binder and plastic sleeve protectors as well as colored paper to attach pictures to and write our stores on. I use the sheet protectors so we can add more information to pictures and families can add information to pictures There is nothing fancy about our story book except for the stories inside. Many times I can find binders in the clearance section of Walmart after school starts. Our Walmart is also generous to donate items as well. Thanks and I look forward to reading about great ideas and suggetions every day. You activities are wonderful for those in care homes. There is however one problem. If you are an activity person, it is you who is expected to pay for all materials that you use with residents on care home. Care homes also have mixed residents - you may have those with dementia and also those with stroke or even parkinsons. All have to have separate activities to engage them. There was the issue of activities fatigue as well raised. Activity therapists are "at the bottom of the pile" as far as being recognised in the caring/nursing environment. There is is little support provided for activity providers and you first have to motivate yourself before you embark on an activity with residents. Your show a very "rosy" picture of life for an activity provider but this is far from the real world of low pay and little recognition. You are quite right George. Activity & Lifestyle workers don’t enter the industry for the paycheck. However very few leave because they are passionate about their chosen profession. I can’t speak for Ireland but in most countries, Activity Professionals have a monthly budget; they certainly are not expected to pay for materials. I am afraid you are feeling down because you are overworked. Consider requesting Management for a monthly budget and place an add in your church or supermarket community board for some volunteers to help you out with the workload. We are all in the same boat, it is not a ‘rosy’ job, but oh! so worthy and fulfilling; it is a privilege to engage with our elders. While sorting out my activity boxes that are used with our Special Needs residents, I found my marbles/rubber bath mat activity. Turn the bath mat over and you have lots of rubber suction cups.With the resident, I then demonstate placing a marble on several suction cups. We also talk about the different sized/coloured marbles and make patterns. It's quite a relaxing activity as they watch/focus on the marbles.Also, I purchase boxes for each activity, label them and keep track of their contents. If staff wish to use them when AO's are not working, I remind them to return to the trolley when finished with. It's a shame if your hard work is misplaced. Education is key.Cheers all! Great ideas Karen. Thanks so much for sharing. Karen, I love the rubber mat idea! I also wondered if some of the men might do it with the little cowboys and Indians you can buy by the bag and use them. I think they would stand up on the suction cups and make it more "manly".....or a bunch of ball bearings. Great ideas! I have a few ladies that will sort and fold socks for hours. They love it. And your laundry department will love you! Hi Kathleen, try to involve them in simple craft and games. For instance colouring or painting mandalas or beach ball or balloons playing. Another simple activity is cutting pictures from magazines (with safety scissors) to make a posters for Easter or St Patrick's Day. Best wishes. Love love these ideas there great.We have found a use for old scratched Cd,s making them into photo mobiles covering only one side with there photo leaving the other side to shine in the sunlight they love these good idea to put above there room doors to. What wonderful ideas.. I have been making activity blankets, and having a ball. This is a new project for me. Most people don't know how to make these things for their friends and loved ones. I am going to make up several of these. Thank You, for the ideas. An activity that our residents enjoy is hitting a balloon with fly swats, they will get increased exercise as they reach out to hit the balloon, purchased alot of fly swats and labeled them for activity use only. Love these ideas and today I am taking in my old button box to sort through with a resident. I thought I'd take in my big office pencil sharpener with the side handle to see if they would enjoy doing this too plus we get all the office pencils sharpened! Hello Carol. Don't beat yourself up over this. You will find that 1:1 is more beneficial and if they have dementia you won't be able to do group activities for any length of time. It is hard to do activities if they are asleep. As for the carers they don't understand 99% of the time. You are the Activity Officer and we think differently to others. Our nursing home is small and most residents wheelchair bound and sleepy with medications. I am finding it extreamly difficult to engage residents therfore facing negativity from staff who me as not doing a good job. Thank you! so much for all the great ideas as I am learning, and going college to work with seniors. This really helps me a lot. Your husband is a very lucky man to have you. Taking care of someone with dementia is rather challenging and the most important aspect of this job you already have; love. Take one day at time and remember to look after yourself as well. Regarding activities just continue to do the usual at this early stage, and seek help when the illness progresses. I wish you all the luck! You may try sensory blankets, individual balloon game, singing, sensory boxes, and poems reading. If your clients have severe communication deficit you may try to hang hand-made mobiles in their rooms with pictures of animals, flowers, children, scenery. Change the mobile every week. Also you could try to place a tall plant in their bedrooms in full view of the client. Good luck! I really need help, I work in a nursing home and am in a part of the nursing home on Monday where my residents are in air beds. What other activities could you suggest besides sensory, hand massage. I have just started a new job as a therapist in a dementia ward & loving it, please help me with some ideas for the residents. Regards Paula. I have managed to source (from Residents Family/Op Shop/Garage Sales...anywhere!) an awesome collection of pretty organza scarves! I pick a short, moderate rhythm old-time song, and make up a sequence of movements to the music. The scarves 'float' magically through the air as their arm movements alow...up.....down....sideways....to the side...'twirl'-in-mid-air....lightly 'shake'..or even 'throw' it up in air - and catch again! Residents just absolutely love it! Can even get them to lift a leg----'flick the scarf under it! So many options for movement! And..they can also sing along whilst doing their exercises-without even realising they are exercising!! Activity is all seated. Loads of fun when you rope the Staff in to teach them your wee routine...& they do a mini concert then & there for the Residents-or along with them! S much fun, & you will find even the most challenging Resident----will take part! Enjoy this with your Residents!! I am putting together a doll therapy program and a baby reminisce program. I would appreciate any ideas and approaches. Regarding your comment about the lady who enjoys cleaning. I wouldn't try very hard to change what the lady is doing. She obviously has done cleaning and mopping before and she enjoys it. I would keep inviting her to other activities and hopefully one day she decides to try something else. It is better to see them doing something they like and do well than frustrated doing something they donâ€™t think they do well. I have a lady coming in my day care centre.She likes sweeping and mopping.Infact she thinks that she visits the day care centre for doing cleaning jobs.she never sits except for playing cards. I have tried so many activities but i couldnt recognise anything thats suits her.Please suggest some ideas. Picture puzzles are a good way to engage the residents I use old calander for this and the residents love then. I have my first day with activities next week. Trying to find many different things to occupy their minds. Woild like themed days for special events. I regularly play music which we all sing/hum too.The fun really starts when we bring out the musical instruments. Staff come from far and wide and join in . The residents faces are priceless! Sounds great, will use in my group assignment on activities for Alzheimer's Disease. In the Dementia Ward where I did the Therapy the most exciting event we did was every Friday lunch when we had fish and chips. I would put servings of fish and chips with a little salt and wrap these in butchers paper. We would sit outside in our under cover area and unwrap the fish and chips and they would eat them with their fingers right down to dabbing their fingers on the salt. We would reminise holiday times at the beach which back in their time is where they used to go at holiday times. Not only for the reminiscing factor it even got the residents who wouldn't eat to eat their lunch. Occasionaly we would decorate with umbrellas and other seaside things. I have also done this a few times. My residents were confused and asked for a plate, knife and fork. Im going to try with a diffrent group on Friday . in the unit we have 4 men very physically able we have started a mens shed with tins of screws , nuts , washers to sort , timber to sand and with a male volunteer there are a few happy hours wittled away chatting , laughing and sometimes deep conversations about the past i suggest if you have this situation discuss it with your manager it creates sometjing for men away from the female folk it gives validation, socalisation and boosts self esteem and self confidence reducing discontentment , depression and feelings of inadequecy. Cover a large table with table cloths. I use fitted sheets to cover my tables for activities. Put on the table a large assortment of artificial flowers, vases, twine etc. The visual sensory attracts everyone, including the men.